Welcome to my rants page! You can contact me by e-mail: bob@goodsells.net. Links to other blogs and more can be found here. I've gone down to join the picket line several times. 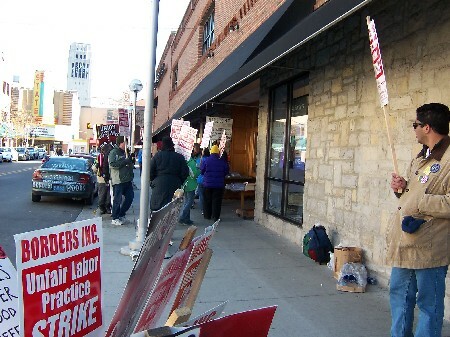 Last night about 5:30 there were some 75 people in the picket line, and a similar number this afternoon at 1. Help support the workers by not shopping at Borders, Amazon, or Waldenbooks until the strike is resolved--in the workers' favor! Several Black Hawk helicopters flew in Iraq today which didn't crash and kill a dozen soldiers while wounding nine more. Right. The US invades Iraq. The US appoints a "governing council," which is not exactly representative or devoted to its work (read Michelle's post about this). A year later, the US will pretend to let governing council govern, and their first act will be to invite the invaders who have been occupying the country for 15 months by then. Yeah, Chalabi, you giant embezzling fraud. That's going to make both the council AND the US troops instantly popular. Are you on Ambien too? "And that includes finding those two?" the reporters asked, referring to Mr. Hussein and Osama bin Laden. "Yes, that's part of it," [Bush] said. "But an even bigger is a free and democratic society. That is the mission." So capturing Saddam is necessary but not sufficient for leaving Iraq. The nearly impossible is also required. This is very bad news for everyone currently in Iraq, Iraqis and occupiers alike. The only silver lining is that it may well lead to regime change in the US, which will finally offer some hope--a year from now. The truth is, I'm afraid, that aWol has no intention of ever really withdrawing from Iraq. They may be fundraisers for Republican conventions. Seriously. It is an unusual charity brochure: a 13-page document, complete with pictures of fireworks and a golf course, that invites potential donors to give as much as $500,000 to spend time with Tom DeLay during the Republican convention in New York City next summer � and to have part of the money go to help abused and neglected children. Representative DeLay, who has both done work for troubled children and drawn criticism for his aggressive political fund-raising in his career in Congress, said through his staff that the entire effort was fundamentally intended to help children. But aides to Mr. DeLay, the House majority leader from Texas, acknowledged that part of the money would go to pay for late-night convention parties, a luxury suite during President Bush's speech at Madison Square Garden and yacht cruises. Is this an exit strategy or a no-exit strategy? Does this suggest that they're planning on announcing the death or capture of Saddam soon, declaring victory and coming home? Or is this just a ploy to buy time for their neocon vision of controlling world oil prices while preparing for the next attacks on Syria, Iran, and Saudi Arabia? My personal axis of evil. Cyndy directed me to this video about this key element of what BartCop calls the BFEE (Bush Family Evil Empire). She also points out that Mikhail Khodorkovsky, the Russian oil billionaire recently arrested by Putin, is a Carlyle adviser. The thit plockens. On the nature of the Iraqi resistance. Though the Bush administration consistently characterizes the nature of the enemy in Iraq as "terrorist," and identifies the leading culprits as "foreign fighters," the notion of Al Qaeda or Al Ansar al Islam using Baghdad (or any urban area in Iraq) as an independent base of operations is far-fetched. To the extent that foreigners appear at all in Baghdad, it is likely only under the careful control of the pro-Hussein resistance, and even then, only to be used as an expendable weapon in the same way one would use a rocket-propelled grenade or IED. For political reasons, the Bush administration and the Coalition Provisional Authority (CPA) haven't honestly confronted this reality for fear of admitting that they totally bungled their prewar assessments about what conditions they would face in postwar occupied Iraq. The failure to realistically assess the anti-American resistance in Iraq means that "solutions" the US and CPA develop have minimal chance of success because they're derived from an inaccurate identification of the problem. A Democrat on the panel who has criticized the accord, former Representative Timothy J. Roemer of Indiana, said in an interview that he believed that the panel had agreed to terms that would let the White House edit the reports to remove the contexts in which the intelligence was presented and to hide any "smoking guns." "The President's Daily Brief can run 9 to 12 pages long," Mr. Roemer said. "But under this agreement, the commission will be allowed to see only specific articles or paragraphs within the P.D.B.'s. Our members may see only two or three paragraphs out of a nine-page report." He said the commission should have insisted on access to the full reports, because "you need the context of how the P.D.B. was presented to the president in order to determine whether or not there were smoking guns." The other Democratic critic on the panel, former Senator Max Cleland of Georgia, has described the agreement as unconscionable. They've clearly got something to hide, probably something absolutely awful. September 11 has been their excuse for their whole miserable "war on terrorism," but we still don't know what really happened. The most depressing thing in the world is that there are still so many Americans who defend our criminal pResident. plus an American civilian contractor and a whole mess of Iraqis. From AP. Of course, our un-elected misleader has squads of brownshirts dedicated to keeping this from happening to him, whether in London, Asia, or Columbus. I wonder if we've been looking at the "free-speech zone" issue the wrong way. That's where the cops direct protesters to little traffic islands or whatever half a mile or more from where aWol is being bribed. Maybe we need to station our protesters everywhere in town not specifically banned by the cops, thereby making the point that the only place in town which isn't a "free-speech zone" is the place where a bunch of Republitrons have paid $2000 each to hear a bad speech. For the record, my personal experiences with "free-speech zones" haven't been so onerous. I went to protest a Bush fund-raiser in July in Dearborn, and our "free-speech" zone was right across the driveway from where aWol was speaking. We of course didn't see the horrible man directly, but his slimy supporters had to walk right by us to go into the hall. And when I went to protest Ashcroft at Cobo Hall in Detroit, we were right outside the entrance. I posted that cartoon because of all of the cartoonists I regularly review at Slate's political cartoon review, Asay is probably the most obnoxious Bush lover. He constantly attacks liberal straw men for hypocrisy, ignoring the flagrant hypocrisy of the Republicans. Until now, that is! If Asay is running an anti-Republican cartoon, the Repugs are in trouble. I hope, anyway! Gore Vidal: All of this is in the USA PATRIOT Act. The Founding Fathers would have found this to be despotism in spades. And they would have hanged anybody who tried to get this through the Constitutional Convention in Philadelphia. Hanged. Marc Cooper: So if George W. Bush or John Ashcroft had been around in the early days of the republic, they would have been indicted and then hanged by the Founders? Gore Vidal: No. It would have been better and worse. [Laughs.] Bush and Ashcroft would have been considered so disreputable as to not belong in this country at all. They might be invited to go down to Bolivia or Paraguay and take part in the military administration of some Spanish colony, where they would feel so much more at home. They would not be called Americans � most Americans would not think of them as citizens. -- LA Weekly, via Blah3. Ambien's common side effects include daytime drowsiness, dizziness, and changes in thinking and behavior. Less common but reported side effects include confusion, emotional instability, and an exaggerated feeling of well-being. Ambien addiction is also more likely among people who have been dependent on alcohol and can cause amnesia. Gee. Sound like anybody we know? And can you freakin' imagine the firestorm if somebody in the Clinton administration had gushed about a drug like this in the middle of a war? BTW: This Modern World is a cool blog when cartoonist Tom Tomorrow is writing it. It is an absolutely AWESOME blog when his friend Bob Harris takes over for awhile, like he's doing right now. Not sticking yet, but starting to come down pretty good. Actually, it's going largely sideways due to the high winds. Parts of Ann Arbor were blacked out last evening, which cancelled my indoor soccer. [Update--Fifteen Minutes Later] Stopped snowing. Sun's out. Welcome to Michigan! [Update--Nine Minutes Later] Sun gone. Snowing again. Screw it. Make up your own headline. He was brought into the US at age four by his parents. While this story just screams hypocrisy on the part of the government, I know I'd much rather go to Mexico than Iraq right now. But his home is in Seattle; he should be able to return there when his army tour is over, hopefully alive and intact. "It's been a violent country for a long time and it very likely will be for a long time. Certainly people need to participate there with their eyes open," he told reporters Thursday while travelling during a flight to Guam. -- AFP. Sure sounds like he's optimistic about Iraq's future, doesn't it? Rummy and Wolfowitz are misguided and insane, but they don't seem to be consistent liars like Bush and Cheney. Their bits of truth-telling may be the greatest threat to the Bushies; I suggest that somebody get them drunk and roll the cameras. "The destruction of this structure will deny enemy forces any use of it in the future," a written statement put out by the 1st Armored Division said. "The facility is a known meeting, planning, storage, and rendezvous point for belligerent elements currently conducting attacks on coalition forces and infrastructure." Destroy the village in order to save it. Then pay Bechtel billions to rebuild it. Planet Earth: The central front in the war on Republicanism. Wal-Mart Posts $2.03 Billion Earnings in 3rd Quarter. When you've got people working for $2 a day, it's easy to make money. Commission officials said that under the accord two members of the 10-member commission would have access to the full library of daily briefings prepared in the Bush and Clinton administrations and that two other members would be allowed to read just the copies of the briefings that the White House deemed relevant to the inquiry. Although the agreement appeared to have the support of most of the commissioners, it was denounced by a Democrat on the panel, former Representative Timothy J. Roemer of Indiana. Mr. Roemer said in an interview that the White House was continuing to place unacceptable limits on access to the briefings. "In paraphrasing Churchill, never have so few commissioners reviewed such important documents with so many restrictions," said Mr. Roemer, who was a member of the joint Congressional committee that investigated the Sept. 11 attacks. "I am not happy with this agreement, and I will not support it." The accord was also criticized by family members of victims of the attacks. The relatives have said all 10 commissioners should have access to the intelligence reports. "Our understanding is that this is an unacceptable agreement," said Kristen Breitweiser, whose husband was killed in the attacks and who is now a spokeswoman for the Family Steering Committee, which represents many of the victims' families. "The details haven't been shared with us. But we understand that this access will be highly limited." The White House...had originally wanted to determine which commissioners would conduct the review. It looks to me like the White House is trying to avoid even the appearance of innocence on this. The only conceivable reason for doing it this way is just to stall further. Fewer eyes reading the documents means it will take longer to find the smoking gun. And since the documents will remain classified, we, the supposed owners of this corrupt government, still won't know what Bush knew. If it ever does make it to the papers, you can be sure that it will be relegated to the back pages by either W's re-election or the war in Syria. But most people, if they notice at all, will just notice the headlines saying that the White House is letting the commission see the papers. At least the reporter comes down pretty clearly on the side of VFP and VVAW. But jeez! This used to be America, even in Florida! Obviously, both types of groups are active in Iraq. The insurgents are clearly the American-led "coalition": I mean what is regime change if it isn't an uprising against the government or ruler of a country? The Iraqis attacking US soldiers are clearly a "resistance," since they are fighting an occupying power. The CIA and AP still have the terminology right, at least as far as the resistance goes; but NBC and CNN have followed the lead of the LA Times and started calling the resistance "insurgents" or "militants," in addition to the all-purpose "terrorists." Tom Brokaw must have said "insurgents" ten times tonight. The term grants illegitimate authority to the invaders. Senate majority leader Frist wants to know: Should the President's nominees to the federal bench be allowed an up or down vote on confirmation as specified in the Constitution? (Hint--that's not what's specified in the constitution. Hint 2: The correct answer is NO) Vote! [Update] Once the voting started going our way, Dr. Frist started screwing with the poll, changing the wording, and even the general meaning of "Yes" and "No". Atrios is following this closely. CNN wants to know if Paul Bremer is doing a good job in Iraq. Your answer will depend on your feelings about death, destruction, and mayhem, I guess. Vote! U.S. Forces Launch Operation in Central Baghdad: U.S.-led coalition forces launched a military operation in Baghdad late Wednesday, setting off a series of explosions that rumbled through the center of the Iraqi capital. In Washington, a Pentagon official confirmed the operation but gave no details about exact location or reason. Up to a dozen detonations were heard about 9:15 p.m., apparently centered away from the heart of the city. The US supported Saddam Hussein for a dozen years of so, not counting US support which helped the Baath party come into power in the first place. We supported Noriega in Panama for several years before turning on him. July: Iraqi Governing Council appointed. Of course, he was lucky (The council member escaped injury but his driver was hurt). On Sunday, US forces killed a US-appointed local leader in Iraq. The Stop The War Coalition said yesterday that it had been told by the police that it would not be allowed to demonstrate in Parliament Square and Whitehall next Thursday - a ban it said it was determined to resist. The coalition says that it has also been told by British officials that American officials want a distance kept between Mr Bush and protesters, for security reasons and to prevent their appearance in the same television shots. Imagine the nerve of those uppity colonists across the pond, daring to show disrespect to the idiot emperor. It is reported that Mr Bush's entourage will number around 500 with up to 200 members of the security service. The Americans are also said to be bringing a US Marine Corps Sea King helicopter, a Black Hawk helicopter and 15 sniffer dogs. Maybe he should go to Rome, instead. They've got to love him there after today's truck bombing in Nasiriya that killed at least 15 Italians. He might not be too welcome back here, either--two more soldiers were killed today, bringing the total, I believe, to 400. How about exile on Elba? From a protest of an aWol fundraiser in Oregon. Thanks, Michelle! My mind remains boggled that Bush got away with that callous, near-treasonous remark. When I was a teenager, I used to drive to downtown Ann Arbor to buy books that I could not get at home. There was no Amazon.com or Barnes and Noble. Nowadays the retail book environment is extremely competitive. Customers are very price conscious and expect discounts. Borders's net income is only 3.2 percent of sales and was only 2.6 percent the year before. Employees should realize that a union cannot negotiate away competitive realities. If Borders were to let its cost structure get out of line with its industry they will become uncompetitive and eventually fail. We have all watched favorite independent stores evaporate. They disappeared because you and I preferred the discounts the larger chains and online sellers were able to offer. It is our buying habits that decide which stores survive and which do not. These are market realities that every retail company must face or they must die. The cost of labor is one of those realities. Frankly, I have done work with Borders and know for a fact that it is most concerned with giving a voice to their employees. I know it has worked very hard to learn what matters most to every employee and to create a compensation package and a work environment that is optimal for the employees within the competitive realities of the marketplace. Borders works to continue to improve its offering. We should all want to keep this great Ann Arbor institution competitive and growing. Rob questions the provenance of the letter writer, thinking it may be a Borders management plant. I think it is more important to focus on the highlighted paragraph (my highlighting). This is a clear example of the thinking of what Conceptual Guerilla calls "cheap-labor conservatives." The argument is that if workers refuse to continually bend over and take it, there will be no more business. My concern is that in today's America, many (most?) people accept the highlighted argument as correct. Stores MUST screw their employees, or die. It's the race to the bottom, and all workers everywhere are now in competition with each other. I don't know the answer, but I know that the answer in the letter means that not only retail companies, but real people, will die if we don't change the current system. Extending the living wage requirements to all companies doing business in Ann Arbor would be a start. We really should fix this before the US is just one more dirt-poor third-world country. U.S. military officials said three or four mortars hit Tuesday night within the Iraqi capital's "Green Zone," the center of most of the U.S.-led Coalition Provisional Authority's activities. The administration and their faithful admirers frequently suggest that it will take time for the grand and glorious democratic free-market everybody-happy Iraq to emerge, even though they were pretty optimistic about quick change just a few months ago (Billmon's got a list of quotes). So, even if you're willing to ignore all indications to the contrary and believe that the Bushies are making progress in Iraq, how do you explain Afghanistan after two years? I'll stand by a statement that I've made before: George W. Bush has done absolutely NOTHING right since being appointed president (or before, for that matter). It's one of the reasons I'm not a Howard Dean fan--he still gives Bush credit for the stupid and pointless war in Afghanistan. I don't think Bush has either an honest or a competent bone in his body, and with the help of the ideological nutcases surrounding him, he's destroying the world. George Soros is right (see below). Well, not really. But we've got a billionaire on our side, George Soros, who just gave $5 million to MoveOn.org. George Soros, one of the world's richest men, has given away nearly $5 billion to promote democracy in the former Soviet bloc, Africa and Asia. Now he has a new project: defeating President Bush. You can join Soros in donating to MoveOn here. I've had my complaints about MoveOn, but they're doing a great job of drawing attention to the many failings of aWol, and now they're doing a great job of fundraising as well. Linsey is attempting to represent the cleaning workers, many allegedly illegal immigrants, in filing the class-action lawsuit. By taking on Wal-Mart, he's representing many more "of the poorest and most vulnerable people in the world" as well. Homer: Ya know Mr. Burns, you're the richest guy I know - way richer than Lenny. Mr. Burns: Yes, but I'd trade it all for a little more. From soldiers killed in Iraq, in today's NY Times. Join the growing list of Borders Workers' Solidarity Bloggers by sending an e-mail to Rob Goodspeed. I've added Goodspeed Update to the blogroll. Rob does a great job of tracking local Ann Arbor issues, including the Borders strike, affordable housing, police issues, and others. Non-Ann Arborites should find it interesting as well. Trade war expected with Europe. Apparently the "free-traders" in Washington gave Europe just enough power in the WTO, in order to get them to go along with it, that they can actually stand up to the US. The poorer countries of the world stood up to the US at Cancun. Hopefully the whole thing collapses into a fetid heap. Is the multinational corporations. According to the Financial Times, many are getting very worried. Rabih Haddad is the Ann Arbor Islamic cleric who was arrested in December 2001 and held, without charges, until July 2003, when he was deported to Lebanon. His wife and children have joined him, and they are now living happily in Beirut. The treatment of these fine people by the Bush administration was completely shameful. CNN asks "Should U.S. courts be able to intervene in U.S. military detentions on foreign soil?" In other words, should the "detainees" at Guantanamo Bay have any rights at all? I think "YES" is the proper answer, but "NO" currently leads 57% to 43%. Many of us felt there had to be something there ... If this had been another country, one would have written a convincing analysis that this guy is lying through his teeth, that there are no weapons in Iraq. But people thought, the President can't say he knows something if he doesn't. That was persuasive, in a way. Don't worry, son. After this, you'll have plenty of company. It makes no more sense to launch an assault on our civil liberties as the best way to get at terrorists than it did to launch an invasion of Iraq as the best way to get at Osama bin Laden. Or to concede an election that you won, for that matter. But that's all raging, destructive, genocidal water under the bridge at this point. Gore said the Bush administration has sought "to rule by secrecy and unquestioned authority," and he accused Republicans in Congress of aiding the White House by threatening to shut down investigations over political disputes. "They have taken us much farther down the road toward an intrusive, Big Brother-style government -- toward the dangers prophesied by George Orwell in his book '1984' -- than anyone ever thought would be possible in the United States of America," Gore said. You're not giving Karl Rove and John Ashcroft enough credit there, Al. Paul Krugman is coming to town! Tuesday, Nov. 11, 7 pm, Ann Arbor District Library. Unlike the bar code, however, the EPC (electronic product code) goes beyond identifying product categories--it actually assigns a unique number to every single item that rolls off a manufacturing line. 8 For example, each pack of cigarettes, individual can of soda, light bulb or package of razor blades produced would be uniquely identifiable through its own EPC number. So, if you buy a pen or a paperback novel or a sweater at Wal-Mart and charge it to your credit card, that item will be linked to you. Conceivably, you could then be identified wherever you went just by the items on your back or in your pockets. Venture into the airport, the drug store, or another Wal-Mart, and they'll know who you are (By they, I mean Admiral Poindexter and John Ashcroft). Big Brother on steroids. Lt. Michael Logghe said that the police department is aware of the concerns about the intersection, but that police have not seen a disproportionate number of accidents there. That people have been literally running for their lives doesn't seem to matter until one or two of them fail. There are only two reasons that there aren't even more pedestrians and cyclists killed on our roads: Most Americans won't even risk walking or riding anymore, and those of us that do proceed with the heightened awareness of an Army patrol in Fallujah. And don't forget that the death toll on our highways EVERY MONTH exceeds that of 9/11. In my review of last night's TV movie below, I failed to mention the pukiest moment. When the Rangers finally found Jessica, they told her "We're American soldiers!" She replied "I'm an American soldier, too!" And the Ranger said "Yes you are" (or something similar) in his best tuck-the-three-year-old-into-bed voice. I wonder if Jessica remembers it that way. Interestingly enough, Lynch -- who was never more than a passive participant in her capture and rescue -- suddenly has taken an active role in that bigger story. In her interview with Sawyer, Lynch supposedly says she believes she was manipulated and exploited by the military to build support for the war. This immediately poses a problem for the people who did the manipulating and the exploiting -- and for the people who believed them. Having a pretty blonde soldier (GI Barbie) to dress up as a war hero is one thing. But having a talking Barbie, and one that doesn't just repeat the little catch phrases burned onto her chip, is another. One guy just called in and said "Lynch is a disgrace and proof that women shouldn't be in the military." Caller just said "She ain't no hero." Time to send in the Liberal Rangers to save her, I guess! Billmon has more on the Freeway Blogger. I'll confess, I watched NBC's docudrama last night. I haven't followed all of the twists and turns of the story, so I can't pretend to vouch for its veracity. Of the stories that have already been discredited by Lynch or others, the only one that I noticed that actually made it into the movie was the one about her being slapped while in the hospital. Even then, they only showed one slap, and did nothing to suggest that she was being regularly abused or tortured. They tried to bring as much drama as they could to what turns out to be a pretty boring story, focusing on the Iraqi lawyer who told the Americans where Lynch was being held. Other than that, the story is: Due to a truck getting caught in a sinkhole, several supply vehicles are left behind by a large convoy. After extracting the truck, they try to catch up but get lost. The CO makes a terrible decision to go into Nasiriya (sp?) before it has been conquered by other US troops. Since they were a maintenance/supply unit, their only weaponry was their rifles. Once in Nasiriya ("so much for cheering crowds," says Jessica as they enter the town to sullen looks), they get trapped by roadblocks and fired on with guns and RPG's. While Lynch helps to keep other soldiers in the back of her vehicle supplied with ammo, she doesn't fire her rifle. Eventually, in the panic and confusion, her friend Lori Piestawa rear-ends the truck in front of them, killing several in the vehicle and wounding the rest, including Lynch. Clearly outnumbered and running out of ammo, the surviving Americans surrender. The rescue mission was portrayed as neither heroic or botched. The hospital had no armed defense; according to the film "Fedayeen" fighters had left the building shortly before to take part in a near-by battle. They found Jessica, put her on a chopper, and then found the graves of the Americans, including Piestawa, who didn't survive. Frankly, the overall story was pretty boring, lacking much in the way of drama. It certainly didn't glamorize the war, and didn't really glamorize Jessica or the rescue, either. Apparently there really never was a lot of a story here, and NBC showed that last night. Chances are the film will rarely get shown again. There's a good article in today's NY Times about a huge aircraft maintenance facility built for United in Indianapolis, using $320 million of state and local tax money, which now stands empty, providing neither jobs nor tax revenues for the area. There was a similar article in Mother Jones a couple of years ago about a shipyard renovated in Philadelphia for a Norwegian shipbuilder, at a cost of $429 million to the taxpayers. Alabama has offered $126 million in incentives to Hyundai to build cars in Montgomery. I was going to write a long rant on this, but I already did, back in May. I'll just update a little: the Borders strike and the Wal-Mart issues and the war are all part of the same struggle to get money and power out of the hands of people and into the hands of corporations. The Congress shall have Power ...To regulate Commerce with foreign Nations, and among the several States. That Congress has allowed this unbridled ruinous competition between states to go on for decades, destroying communities, unions and the environment, when they have full constitutional authority to regulate or even stop it altogether, is one of the clearest signs of who they actually work for (hint--if you're not a millionaire, it's not you). Atrios asks why the cities and states don't have smart lawyers who require the corporations to assume more of the risk when they receive this corporate welfare? Short answer, IMHO: There's always another state, or country, willing to offer them the same deal with making them assume the risk. Borders employees here in Ann Arbor are striking against the store. I just came back from joining the picketers for an hour. Please help them by not shopping at Borders, Amazon.com, or Waldenbooks until the strike is settled and the workers get the benefits they deserve.